As Star Trek™ turns 50, we look back and celebrate one of the most influential series of all time. Dressed in her iconic red uniform, Lieutenant Uhura stands poised and powerful. 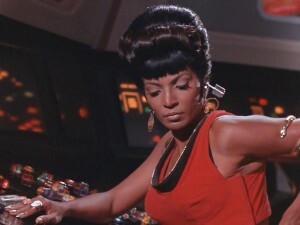 Managing all incoming and outgoing ship communications, Uhura is an integral part of the U.S.S. Enterprise command crew. Uhura is smart, savvy, and futuristically fabulous, with a face sculpted in the likeness of the actress who brought this groundbreaking character to life. The image is from the Barbie Collector website where she can be ordered. 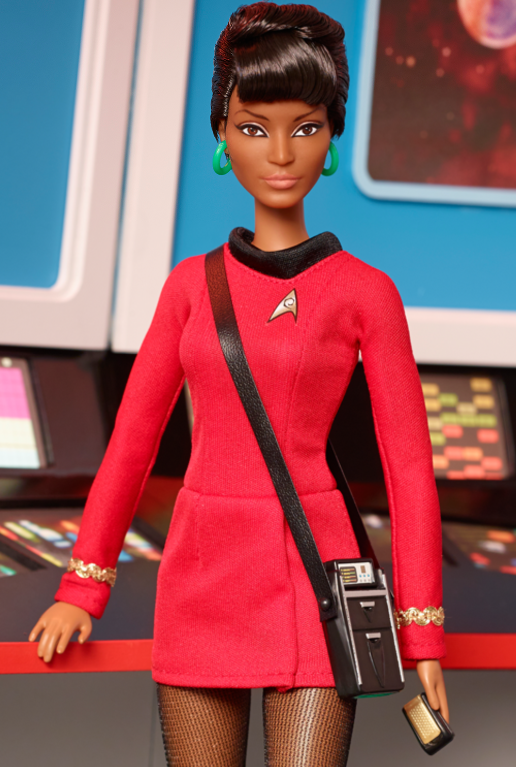 For me, the Lieutenant Uhura doll is more than just another beautiful African American Barbie® doll. In 1966, when Star Trek first hit the television airwaves, I was a young girl whose head was already in the stars. My reason for tuning in every week wasn’t so much to follow the episodic adventures of the USS Enterprise (1701) and her crew but to watch Nichelle Nichols in her role as Communications Officer Nyota Uhura on the bridge alongside Captain Kirk, Mr. Spock, Mr. Sulu, and Mr. Chekov. Her character was a bold addition to Star Trek that added to the diversity on the bridge of the Enterprise and, as explained in the authorized biography of Gene Roddenberry as well as in interviews with Ms. Nichols, the African female communications officer was as intentional as Hikaru Sulu, the Asian helmsman, and Russian navigator, Pavel Chekov, and of course, Mr. Spock, science officer from the planet Vulcan. Looking at my Uhura Barbie®, I thank Gene Roddenberry for sticking to his original idea of a diverse starship crew in the 23rd Century and refusing to give in to the then political views of men in suits who did not want audiences to see the possibility of an African woman in a position of equality with the other male characters on the bridge. Of all the characters in his original script for the show, Uhura was the one that studio executives openly objected to and in many cases demanded Roddenberry change the ethnicity/gender of Uhura or eliminate the character all together. For those readers who are not Trekkies or steeped in the backstory of the characters, Lieutenant Uhura, while portrayed in the television series by an African American woman (Nichelle Nichols), hails from the United States of Africa, a fictitious, futuristic political state where all African countries have come together. (Sulu’s character is similar as he was created to represent all Asians). Her native language is Swahili and her name means “Freedom.” As Communications Officer, her role was critical to the five year mission of the Starship Enterprise as she was responsible for the technical side of space communication as well as translation. The Universal Translator that is seen in her ear is but one of Roddenberry’s technology creations and allowed Uhura to translate alien transmissions and communications. When we look at how communication has advanced over the last fifty years, what was science fiction has become science fact. The flip phone, modeled after the Star Trek communicators, are now old technology and research is being conducted and prototypes are being built and tested that will one day give everyone on the planet the ability to translate any language in matters of seconds. Uhura was inspiration and a role model for every little girl, regardless of her ethnicity, to believe that one day in the future, she could be in space. Nichelle Nichols, who after season one decided to leave the show to pursue her career in musical theater, was persuaded by Dr. Martin Luther King, Jr. to remain as her character was too important and influential to young African American boys and girls, particularly his family, who he explained all watched her on Star Trek every week and were her biggest fans. Aside from her work on Star Trek (TOS) and in subsequent Star Trek movies, Ms. Nichols used the significance and the power of the character of Lieutenant Uhura to recruit astronaut candidates for NASA. Sally K. Ride, the first American woman in space, and Judith A. Resnick another member of the first women astronauts were recruited with the help of Ms. Nichols. The first two African American male astronauts, Guion Bluford and Ronald McNair, joined NASA as a result of her recruiting efforts as well. The connection between Star Trek and NASA has been strong since Star Trek (TOS) first aired. While Mattel has released Star Trek dolls in the past, the face sculpt of Uhura is beautiful and does a good job of coming very close the likeness of Nichelle Nichols. I am keeping this one in the box in my collection but I will be buying a few more to create Uhura’s in costumes from other Star Trek episodes where she is not in her Star Fleet uniform as well as taking her around with me to workshops, talks, and other space programming I’m planning for the fall. I am still amazed that for most of the students I have taught and currently teach, Star Trek is not part of “their universe.” Many of them have never seen any Star Trek television episodes or movies and when I ask why the usual response is, “I’m not interested in that stuff.” Bringing a Uhura Barbie® doll with me as a way to introduce girls to NASA, space, and technology was one of the first ideas that came to mind when I saw her on the shelf. Seeing is believing and Uhura, fifty years later, is and will always be an inspiration to any girl or woman to believe that space is the final frontier to be conquered and as women there is a place in space for us. To all girls who look up and wish on stars like I did wishes do come true. So after you make your wish remember to add “Yes I can.” Uhura is counting on you!